PHOENIX, AZ (May 24, 2018) – As the Arizona Senate race heats up for what is sure to be a close primary and general election there is still a lot of jockeying for first place. Beyond bringing fresh insights through original polling on the race OH Predictive Insights decided to also look at the financial situation in the Senate contest. The first chart below shows how much money is raised on the side by the thousands and also the burn rate or how much of the cash raised has been spent. “Money raised by any one campaign is a strong indicator of support and the type of backing one has especially when looking at individual versus PAC donations,” said Mike Noble, Managing Partner and Chief Pollster at OH Predictive Insights, a Phoenix-based leading behavioral research polling company. Democrat Kyrsten Sinema absolutely dominates the fundraising field with over $6.5 million hauled in raising more than all her Republican opponents combined. She also has $4.4 million cash on hand compared to only $3.2 million cash on hand combined from her Republican opponents. Joe Arpaio was a prolific fundraiser when he was Sheriff although has fallen way behind with barely half a million in total cash raised. 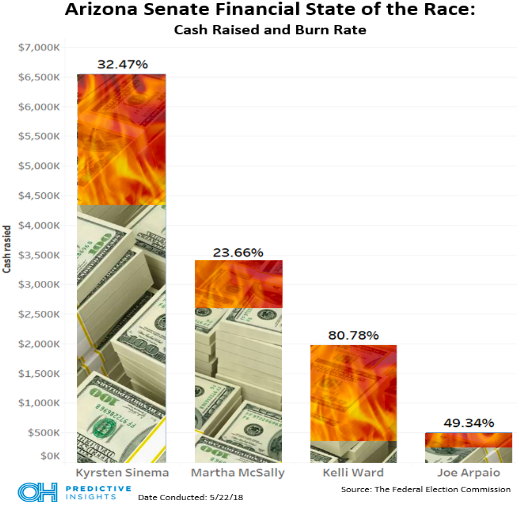 Looking at the burn rate Sinema has spent a lot for having no real challenger in the primary, but Ward seems to be spending it just as fast as she receives it with over 80% of her contributions spent already. This makes sense in a close primary and McSally has a lot to use indicating that she is either holding her fire until getting closer to the primary date or is more in the mentality of preparing for a general election. This next chart looks at what percentage of the money raised that came from individual donations rather than a committee contribution. Both Sinema and McSally derive a little over 60 cents for every dollar from individual donations and the rest comes from political action committees (PACs). Ward and Arpaio, however, have raised nearly all their money from individual donations although they have raised less. "It's clear with Sinema and McSally that having establishment support is more than just a symbolic gesture, it creates a cozy financial safety net of available fundraising that Ward and Arpaio can't lean on for campaign help,” said Noah Rudnick, Data Analyst with OH Predictive Insights.